I took my wife to the Geisha House for our anniversary, last year. They treated us like royalty! It is a romantic restaurant with a fun atmosphere. And you will love all the creative drinks on the menu. My wife and I really liked the Spicy Rock Shrimp Tempura. We didn’t like the black cod much, so you might try the short ribs or the lamb chops instead. Of the two, I think I would go with the short ribs. Other Geisha House specials you can enjoy include Half Off your food, every Monday evening; Build your own Sushi Roll, every Wednesday night; Half Off all alcohol during Lakers games, excluding bottles and a special $3 Happy Hour menu; Rock and Roll Tuesdays, featuring all Sushi Rolls for only $7, while you rock out to the greatest hits all night; and Sake Saturdays, when you can buy one carafe or bottle of sake and get the second one, of equal or lesser value, for free! Also, from Tuesday through Thursday, enjoy No Corkage Fees, for a limited time only. 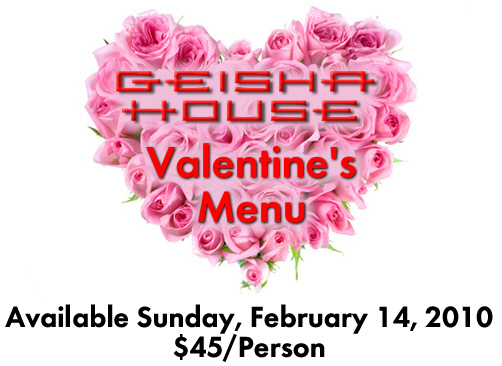 Santa Ana’s Geisha House is located at the CityPlace, at 2773 N. Main St. Click here to make your reservation.